Our friend Chris Bruntlett recently returned to Vancouver from a vacation that included stops in both Toronto and Montreal. In an article in Hush Magazine, Bruntlett elegantly summarizes his travel experiences while lamenting Vancouver’s sport/recreational bicycling culture and British Columbia’s unfortunate all-ages mandatory helmet law. “Toward the end of our stay in Toronto, my wife and I were taking a morning stroll along Dundas Street, when we witnessed the most amazing sight: an elderly Italian man, dressed in his Sunday best, dragged a rusty old single-speed out of his garage and onto the street in front of us. Without missing a beat, he hopped onto it and pedaled down the road, undoubtedly making his weekly pilgrimage to church. This is something we just don’t see here, and won’t until we accept the bicycle as a means of transportation, and not just recreation. Please take the time to read the full article. Chris has a marvellous way with words, and a wonderful vision for his own city and the world. A few months ago I was hit by a car while riding my bicycle. While my helmet-less head hit the pavement, I only had a minor head injury. I think the doctor who did the MRI was disappointed. She included riding-with-a-helmet safety instructions in the discharge instructions. Everyone–bicyclists and non-bicyclists–“reminded” me of how important it is to always wear a helmet. I’m 59 years old but was made to feel like a child. Meanwhile, my worst injury was the pulled muscle in my leg that made it difficult to mount my bike for a few weeks. I have caved and for now ride with a helmet. I pasted the word “duress” on its top. So I wear my helmet under duress. I do wear a helmet, but is also under duress. On my daily commute here in the UK, I am frequently opposed by car drivers (not all though) who make it clear they object to me being in their way, despite the fact I ride within the law. I believe prevention is better than cure, and while helmets may provide some protection in a head-on-concrete scenario, half the trouble is we are not addressing the cause. As the old saying goes, “safety is in numbers” and all the time people are being discouraged to ride a bike (such as forcing the helmets on to our heads), the situation will not improve. I agree to wear a helmet for several months this year while I was taking a blood thinner, at the request of my doctor. My prescription was discontinued just in time for the intense summer heat of Phoenix. There is just no way I can wear a helmet in temperatures over 100. Even in this car-centric city, I feel pretty safe riding without a helmet. I’m a slow bicyclist and think being aware of my surroundings and putting thought into which route I choose keeps me as safe as anything else. Bike lanes and an increasing public awareness of bicyclists on the road helps a lot, too. A few months ago when I was t-boned by a car that went through a red, I didn’t even come close to hitting my head. When I would talk to (certain) people, first thing they asked was “did you have a helmet on” or “bet you’ll wear a helmet from now on”. The incidents where helmets *may* actually play a role in helping people is just too slim. Helmets seem to be the panacea when it comes to cyclists and accidents. There has only been one occasion when a helmet came in handy, and I was actually wearing one, when I was barrelling down a road in some French mountains and my bike started to shimmy. I stopped myself from serious injury by steering into some kind of bush, the only one, in the curve I was approaching. The rest of the time I sit on my Dutch bike, wearing regular stuff, and the only head-gear I use is a hat when it’s raining or cold.As long as cyclists are considered some kind of sub-species of homo sapiens, not to be taken seriously, they’ll never get the infrastructure that will make cycling safe for all. I came off in a shimmy too, the trick is to unload the saddle or squeeze the top tube with your knees and it will go away. Do not use the front brake if possible. People always start with the helmet, as if it’s the most vital piece of safety equipment. Whilst the brain is indeed the most important area to protect, I’d like to add that I’ve come off my bike over 6 times now and not once have I landed on my head. It’s ALWAYS been the knees, ankles, elbows and especially the hands that get the worst of the impact. We put a lot of emphasis on wearing helmets when riding bikes, but my latest decision has been to start riding around in a lightweight armoured motorcycle jacket and pants. People think I’m completely over-dressed for the bike, but it’s SAVED MY SKIN when I came off at speed. I walked away with a minor cut, nothing more when a person wearing normal clothes would have had enormous torn layers of skin, gashes and possibly broken elbows or knee caps. It does make riding fast harder, this is true. But I ride fast in general, especially down hill. Wherever there is a text against compulsory bicycle helmets use, there you’ll find people from the helmet army saying how or why they wear one. Everytime there is an accident involving a cyclist and a vehicle, the media always mentions whether or not the cyclist was wearing a helmet without knowing injuries, etc., and then they always say “and the driver wasn’t hurt”. Who gives a crap about the driver inside of a big metal box that didn’t get hurt? I’m one of those who likes to wear a helmet – it’s the only place on my head I can attach a GoPro to without drilling holes in my skull. On the flip side, last weekend, I had a friend who got her wheel stuck while riding over train tracks and ended up wrecking. Her helmet: broke into several pieces. I suspect she is thankful that she opted for safety over silly perceptions of stylishness. I bike commute to work every day in “normal clothes” that includes dresses and skirts, and a helmet. It is about attitude, people. What is the real purpose of the headline? Have you lived in Vancouver within the last few years? I still go back several times annually to Vancouver because we have a 2nd home there and bike around..we live downtown right at the foot of a major bike path that’s connected to other bike paths/signed bike routes. I lived and cycled there for 8 yrs. We are car-free…last 22 yrs. as cyclists. 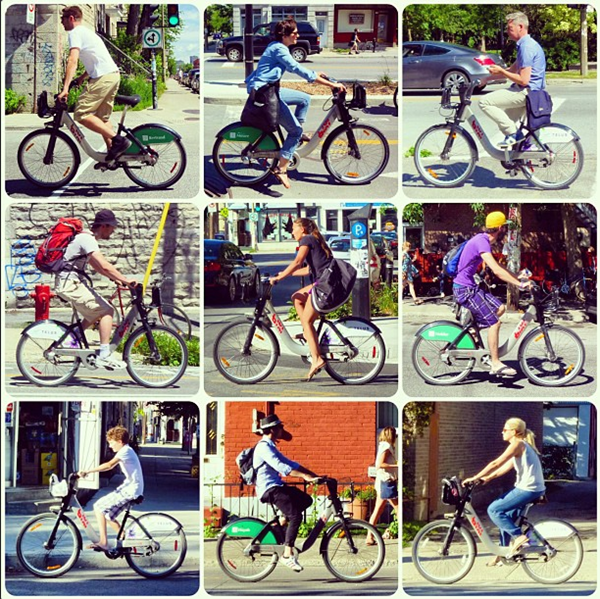 I don’t see any difference between Toronto and Vancouver regular cycling traffic of more or less cyclists in streetwear vs. lycra vs. helmets /no helmets between the 2 cities. There’s enough cyclists in Toronto wearing helmets like Vancouver, that Toronto isn’t ” better” than Vancouver for not wearing helmets. Since I live, work and cycle in Calgary year-round (it’s colder than Toronto @-25 to -30 degrees C as the norm in winter): I can say unequivocally that Calgary is dominated by helmeted cyclists …because its cycling infrastructure is poorer than either Vancouver or Toronto. Now our recent major flood, is making is more complicated for cyclists because of some damaged bike-ped, bridges, path underpasses, etc.